You'll be glad to hear that the unstoppable hitman and master of disguise, Agent 47, is on your side in this themed slot from Microgaming. Stay as cool as the protagonist himself and this slot could pay out some prizes worthy of an international assassin. The five reels offer 15 paylines, in addition to an impressive potential jackpot of up to 270,000 coins. What's more, this ice-cold slot features a number of bonus game modes to improve your chances. 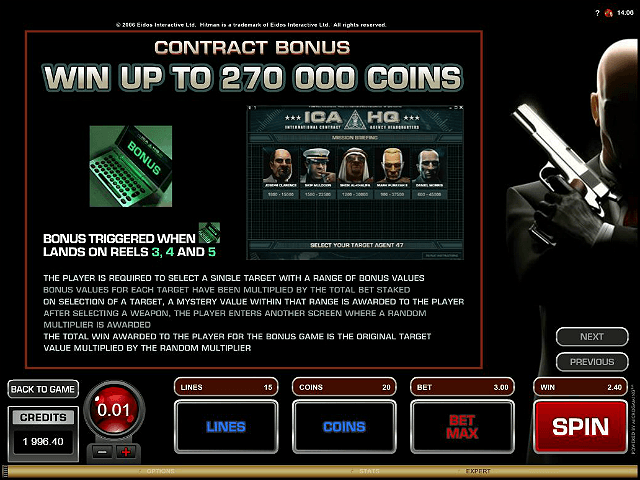 Play Hitman Slot Demo for Free! Play Hitman for Real Money! 200% Welcome Bonus up to £500 + 50 Extra Spins! 100% Welcome Bonus up to £300 + 20 Extra Spins on Starburst! Join the army of Casumos trying to "erase boredom" at Casumo Casino. Armed with partnerships from a wealth of the world's top game developers and over 500 popular slot titles, slot lovers and the casumos are prepared to fight back against boredom among UK casino dwellers! 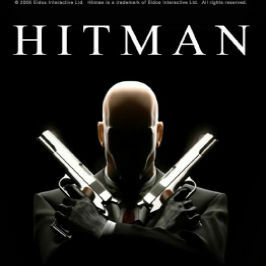 This online slot is based on the Hitman franchise of video games, where players direct a genetically engineered assassin, Agent 47, as he completes contracts around the globe. Microgaming have woven these themes throughout the slot; it's dark, striking, and full of references to the original games. 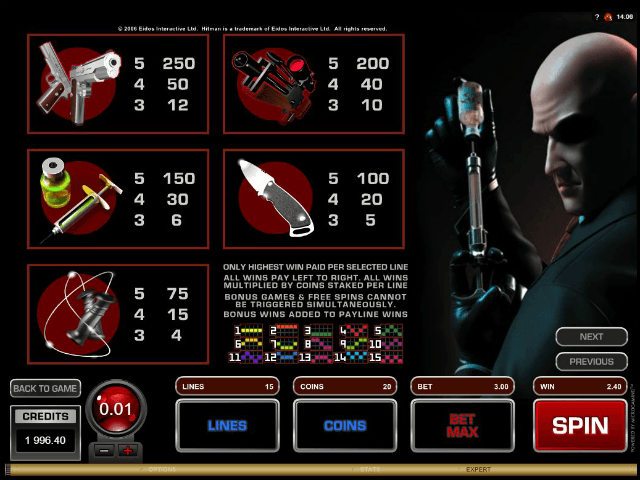 Graphically, Hitman online slot is sharp and clear. The black background makes your spin, betting, and coin details easy to read at a glance, and the atmospheric sound track makes for an immersive experience. 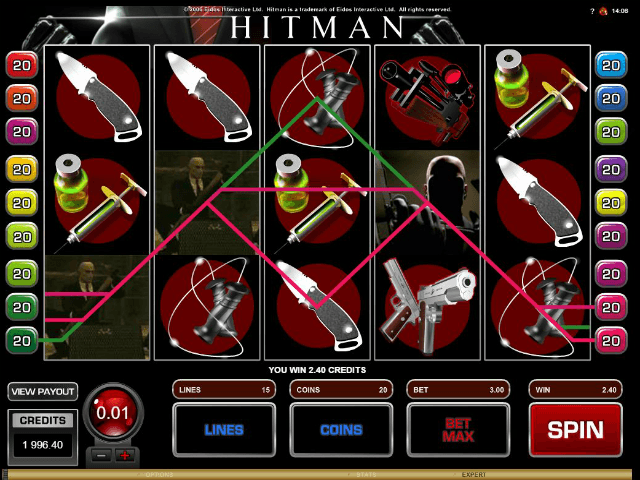 Hitman boasts 15 paylines to take advantage of, spread over five reels. The standard symbols are representations of iconic weapons from Hitman's arsenal, with fans certain to recognise the infamous garrote, and 47's trademark silverballer pistols. The special modes are activated with the '18' symbol, and 47 himself is the wild. In terms of betting, you can set the stakes as low as 0.1 to start with. The maximum bet is 0.25 coins: so while you have to stay fairly reserved on your betting, the high jackpot multiplier and max bonus game payout (a whopping 270,000 coins) more than makes up for it. There are three possible bonuses in Hitman. The first is the Expanding Wilds, which you can get by landing Agent 47 himself on reels two, three or four. The Agent 47 icon will then fill all positions on that reel, helping you trigger the other bonuses. The Contract Bonus has the highest potential payout of all the modes. Activate it by getting a laptop symbol on reels three, four, or five. Once you've done this, a number of potential assassination targets will appear on the screen, each with their own payout. Choose your target to get your cash prize. The Free Spins mode is activated by lining up three of the '18' symbols on reels three, four and five, much like the Contract Bonus. You'll get 18 free spins, and a 2x multiplier for anything you win. Even better, the other two bonuses can be activated from the free spins. 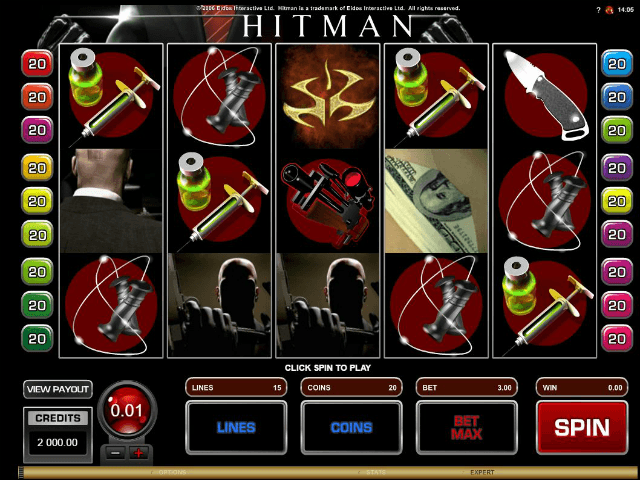 Overall, the Hitman online slot game is one cool customer, with plenty of nuances to keep you spinning. Share this Hitman Review today! If you like Hitman, you'll love these slot titles too!